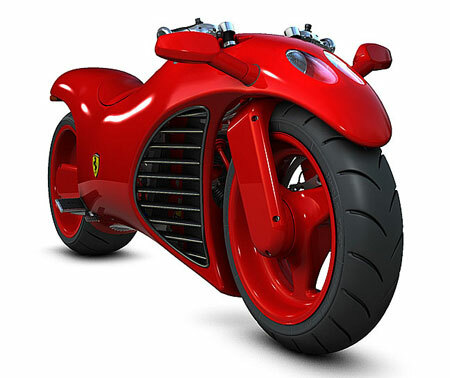 The Ferrari V4 superbike concept is a design created independently of Ferrari by Israeli designer Amir Glinik. While the styling of the Ferrari V4 motorcycle might be controversial to say the least, it certainly stands out from the crowd. And in part that's what a Ferrari is supposed to do. The aesthetics of the Ferrari V4 motorbike have been influenced by both classic and modern Ferrari vehicles, but revised and repackaged into a motorcycle. Under the highly curvaceous bodywork of the Ferrari V4 motorcycle is, unsurprisingly a V4 engine. This unit is derived from the Ferrari Enzo V12 block, which has been cut down and redesigned into a V-four cylinder configuration. The engine features ride-by-wire throttle control and is mated to a mono-block gearbox that support the swing arm. One of the more unusual features of the Ferrari V4 superbike is is adjustable ride-height suspension and dampening control. Riders can choose from two separate ride heights and two shock damping styles for each ground clearance setting. The brakes of the Ferrari V4 superbike concept consist of radial mounted discs and twin calipers up front. Both front and rear brakes are electronically operated and computer controlled to provide optimal braking under all road and weather conditions. A weatherproof touch screen display is mounted flush into the top of the fuel tank, directly in front of the rider. From this interface the rider can manage bike systems or monitor information and diagnostic information, including; radio, GPS, anti-theft device, RPM, speed, and current gear.